Daniel Dumile (/ˈduːmɪleɪ/ DOO-mil-ay; born January 9, 1971), best known by his stage name MF Doom (stylized as MF DOOM), is an English-born, US-based rapper, songwriter and record producer from Long Island, New York. Best known for his "super villain" stage persona and unique lyrics, Dumile has taken on several stage names in his career. He has appeared in several collaborative projects such as Madvillain (with Madlib), Danger Doom (with Danger Mouse), Doomstarks (with Ghostface Killah), JJ Doom (with Jneiro Jarel), NehruvianDoom (with Bishop Nehru), and Czarface Meets Metal Face (with Czarface). Dumile was born in London, England, the son of a Trinidadian mother and a Zimbabwean father. His family moved to Long Island, New York when he was a child; Dumile remains a British citizen and has not gained American citizenship. As Zev Love X he formed the group KMD in 1988 with his younger brother DJ Subroc and another MC called Rodan. When Rodan left the group, Zev found another MC, Onyx the Birthstone Kid, to replace Rodan. A&R rep Dante Ross learned of KMD through the hip hop group 3rd Bass, and signed the group to Elektra Records. Dumile and KMD's recording debut came on 3rd Bass's song "The Gas Face" from The Cactus Album, followed in 1991 with KMD's album Mr. Hood, which became a minor hit through its singles "Peachfuzz", "Who Me?" and heavy video play on cable TV's Yo! MTV Raps and Rap City. In 1993, just before the release of the second KMD album, Black Bastards, Subroc was struck by a car and killed while attempting to cross the Nassau Expressway. The group was subsequently dropped from Elektra Records that same week. Before the release, the album was shelved due to its controversial cover art, which featured a cartoon of a stereotypical pickaninny or sambo character being hanged from the gallows. After the death of his brother, Dumile retreated from the hip hop scene from 1994 to 1997, living "damn near homeless, walking the streets of Manhattan, sleeping on benches". In the late 1990s, he left New York City and settled in Atlanta. According to interviews with Dumile, he was also "recovering from his wounds" and swearing revenge "against the industry that so badly deformed him". Black Bastards had become bootlegged at the time, leading to Doom's rise in the underground hip hop scene. In 1997, Dumile began freestyling incognito at open-mic events at the Nuyorican Poets Café in Manhattan, obscuring his face by putting a woman's stocking over his head. 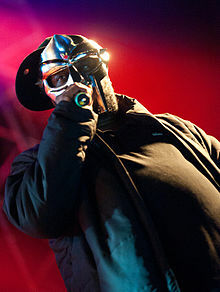 He meanwhile had taken on a new identity, MF Doom, patterned after and wearing a mask similar to that of Marvel Comics super-villain Doctor Doom, who is depicted rapping on the cover of the 1999 album Operation: Doomsday. The album, in an earlier incarnation, would have been called The Super M.F. Villains according to an interview published in 1998 by hip-hop music culture magazine Ego Trip. Later versions of the mask would be based on a prop mask obtained from the film Gladiator. He wore this mask while performing and isn't photographed without it, except for very short glimpses in videos such as Viktor Vaughn's "Mr. Clean", "? ", and in earlier photos with KMD. Dumile released three singles on "Bobbito" García's Fondle 'Em Records, "Dead Bent", "Greenbacks" (1997), and "The M.I.C." (1998). In 1999 Fondle 'Em released MF Doom's first full-length LP, Operation: Doomsday, which included these singles and their b-sides, and additional tracks. Dumile had used the spelling variant "M.F. Doom" for the singles’ releases, but thereafter changed this to MF Doom. Among the collaborators on these tracks were fellow members of the Monsta Island Czars collective (The M.I.C. ), for which each artist took on the persona of a monster from the Godzilla mythos. Dumile went by the alias King Geedorah, a three-headed golden dragon space monster, modeled after King Ghidorah, the Toho movie monster who was a three-headed dragon that often battled Godzilla. Some of his appearances on the LP are as, and are credited to, this persona instead of that of MF Doom. Dumile would revisit this character later under various name-spellings. In 2001, he began working with Prince Paul, co-producing MC Paul Barman's "Paullelujah!" with MikeTheMusicGuy and Phofo. In 2002, he appeared on the Sound-Ink's Colapsus collection, on a very hard to find track titled "Monday Nite at Fluid", featuring Kurious with production by King Honey, who also produced some tracks for Dumile's album Vaudeville Villain. Dumile has produced all the instrumentation tracks for his solo releases, with very few exceptions. Beginning in 2001, under the "Metal Fingers" moniker, Dumile began releasing his Special Herbs instrumentals series. Many of these beats can be heard as the instrumentation tracks throughout his body of work. A separate website catalogs for which tracks each instrumental has been used. In 2003, Dumile released the King Geedorah album Take Me to Your Leader. Geedorah is credited as producer, but only appears as an MC on four tracks. The majority of vocal tracks feature guest MCs, and the album features several instrumental montages of sampled vocals from old movies and TV shows—a technique employed on most of Dumile's albums. Later in 2003, Dumile released the LP Vaudeville Villain under the moniker Viktor Vaughn (another play on Doctor Doom, whose "real name" is Victor von Doom). In 2004 he released a follow-up LP under the Viktor Vaughn moniker, Venomous Villain. Later in 2004, the second MF Doom album MM.. Food was released by Minnesota-based label Rhymesayers Entertainment. Doom's first commercial breakthrough came in 2004, with the album Madvillainy, created with producer Madlib under the group name Madvillain. Released by Stones Throw Records, the album was a critical and commercial success. MF Doom was seen by mainstream audiences for the first time as Madvillain received publicity and acclaim in publications such as Rolling Stone, The Washington Post, The New York Times, The New Yorker, and Spin. A video for "All Caps" and a four-date U.S. tour followed the release of Madvillainy. On track 14 "Figaro", Doom is observed as the person to use "ghost" in the context that gained traction around 2012-2014. Although still an independent artist, MF Doom took a bigger step towards the mainstream in 2005 with The Mouse and the Mask, a collaboration with producer DJ Danger Mouse under the group name Danger Doom. The album, released on 11 October 2005 by Epitaph and Lex, was done in collaboration with Cartoon Network's Adult Swim and featured voice-actors and characters from its programs (mostly Aqua Teen Hunger Force). Danger Doom reached #41 on the Billboard 200. In 2005, Doom made an appearance on "November Has Come", a track on Gorillaz's 2005 album Demon Days, which reached #6 on the Billboard 200. Doom produced tracks for both of Ghostface Killah's 2006 albums Fishscale and More Fish, it was also announced that the two were working on a collaboration album together as Doomstarks – then titled Swift & Changeable. Three tracks have been released since the album was announced, "Angels", which appeared on a Nature Sounds compilation in late 2006 (another version appears on Doom's 2009 album Born Like This), "Victory Laps" and "Lively Hood" (a 2015 Adult Swim single). The Madvillain song, "Monkey Suite", first appeared on the Adult Swim/Stones Throw Records compilation Chrome Children, later it appeared on Madvillainy 2 – The Madlib Remix. On May 30, 2006, Adult Swim released the Danger Doom Occult Hymn EP, a digital EP and on July 6 the same year Lex released Danger Doom Old School EP. The latter includes previously unreleased remixes by Madlib and Danger Mouse. Kidrobot and Stones Throw released an 8" tall Madvillain toy available to coincide with the release of the Chrome Children CD/DVD which featured a clip of a live performance of Madvillain. He continued to work with Adult Swim, doing voice-over work as Sherman the Giraffe on Perfect Hair Forever, being the voice for The Boondocks ads and previews and hosting their Christmas Eve 2006 programming. Following the success of Danger Doom, he signed a long term agreement with Lex in 2006. With the exception of a handful of guest appearances, there were no Doom releases between mid-2006 and the release of Born Like This. Doom's Born Like This was released on Lex Records on March 24, 2009. The album was Doom's first solo album to chart in the USA. In early 2010, he released the Gazzillion Ear EP on Lex which included the Thom Yorke Remix and two mixes by Jneiro Jarel. A further remix by Madvillainz featuring a voice-mail message from Kanye West was released online. The release of the Gazzillion Ear EP coincided with Doom's first ever live performances outside North America. On 5 March 2010, Lex and Sónar presented the first Doom show in London, at The Roundhouse in Camden. The event was the first of many Doom live performances around the world between early 2010 and the present. These shows included the Lex 10th Anniversary show at The Roundhouse with Ghostface Killah and Jneiro Jarel, performances in Europe with Gorillaz, support for Portishead and performances with Jneiro Jarel at Bestival 2012. During this period Doom released some material on labels other than Lex. On 26 May 2010, part of the track Madvillain "Paper Mill" was released a digital single through Adult Swim. Expektoration, a live Doom album, was released on 14 September 2010 through Gold Dust Media. Upon completing his European tour, Doom was refused entry into the United States. Regarding the case, he stated that "there's a lot of legalities" and that he was "done with the United States." Doom settled in the UK and began recording an album with fellow Lex artist Jneiro Jarel, under the moniker JJ Doom. Doom contributed two exclusive JJ Doom tracks to the Lex 10th Anniversary compilation album Complex Volume 1. The tracks were the Doom / Thom Yorke / Jonny Greenwood version of "Retarded Fren" and the Dave Sitek remix of "Rhymin Slang". They were released digitally in December 2011, and were subsequently released on vinyl on Record Store Day 2012. The JJ Doom album Key to the Kuffs was released on August 20, 2012, and included guest features from Damon Albarn, Beth Gibbons of Portishead, Khujo Goodie of Goodie Mob and Dungeon Family, and Boston Fielder. On August 19, 2013, an extended version, titled Key to the Kuffs (Butter Edition) was released, containing a bonus 9-track EP composed of new tracks and remixes. In February 2013, Ghostface Killah revealed that he and Doom were in the process of choosing tracks for a collaborative album. In August 2013, Doom appeared on the Captain Murphy track "Between Villains" from the Adult Swim Singles Program 2013 as his alter-ego Viktor Vaughn. The track also featured Earl Sweatshirt and Thundercat. The project was revealed to be an album, titled NehruvianDoom, and was released on October 7, 2014. Doom collaborated with Flying Lotus in November 2014 on the track "Masquatch", which appeared on the FlyLo FM radio station from the reissued Grand Theft Auto V. In December 2014, Ghostface Killah announced that his and Doom's long-announced collaborative album Swift & Changeable would be released in 2015. The date would later be changed to February 2016, although it has not been released. Doom was featured on The Avalanches' single "Frankie Sinatra" in 2016. In 2017, Doom released a track under the Danger Doom alias, entitled "Mad Nice" with features from Black Thought and Vinny Price. In August 2017, a compilation album, The Missing Notebook Rhymes, was announced, consisting of music from his upcoming projects, as well as songs from other artists that he is featured on. Each track would have been released digitally on the Adult Swim website per week over the course of fifteen weeks, however on 27 September 2017, this arrangement was canceled. In February 2018, Doom and Czarface released "Nautical Depth," the first single from their collaborative album, Czarface Meets Metal Face. The album was released on March 30, 2018. On 18 December 2018 Doom and Cookin' Soul released DOOM XMAS, a Christmas remix album. Dumile has used stand-ins to perform on his behalf. He claimed that he had lost weight and thus looked and sounded different, before his road manager admitted the use of imposters was an intentional choice by Dumile. At one show, an impostor Doom was booed off stage, before being replaced by the real artist. In an interview with The New Yorker, Dumile said that he is both the writer and director, and that he "might send a white dude next", adding "whoever plays the character plays the character". Dumile's son, King Malachi Ezekiel Dumile, was born on 22 February 2003 and died on 18 December 2017. ^ a b c d e f g Dan LeRoy. "Allmusic profile". Allmusic.com. Retrieved 28 September 2010. ^ Jenkins, Craig (11 May 2012). "MF DOOM Says He's Done With The United States". Potholes In My Blog. ^ Mlynar, Phillip. "A Revealing DOOM Q&A: Supervillain on Nas' Pool Parties, His Rap-Hating Mom". Spin. Spin. ^ Hsu, Hua (1 March 2005). "Mask of Sorrow". The Wire. Archived from the original on 5 May 2006. ^ "International God of Mystery: An M.F. 'n Look Back With M.F. Doom". Egotripland.com. Retrieved 30 November 2017. ^ Ryon, Sean (27 July 2012). "Graffiti Writer KEO Discusses Origin And Creation Of MF DOOM's Mask". HipHopDX. Archived from the original on 27 January 2016. Retrieved 14 August 2016. ^ "MF DOOM Discography". Official Doom Discography. Retrieved 2012-11-10. ^ "Metal Face Doom Special Herbs etc. series discography". metalfacedoom.com. ^ Nick Sylvester (2004-11-15). "MF DOOM: Mm..Food? Album Review". Pitchfork. Retrieved 2016-09-04. ^ "The Mouse and the Mask". Billboard.com. Retrieved 2012-11-10. ^ "Demon Days". Billboard.com. Retrieved 2012-11-10. ^ Martens, Todd (19 October 2005). "Danger DOOM Hopes to Make Second CD". Billboard.com. ^ Paine, Jake (1 April 2009). "Hip Hop Album Sales: The Week Ending 3/29/2009". Hiphopdx.com. Retrieved 31 May 2012. ^ Patrin, Nate (January 7, 2010). "Reviews: DOOM Gazzillion Ear EP". Pitchfork.com. ^ Rees, Thomas (December 17, 2009). "DOOM "Gazillion-Ear (Madvillainz Remix feat. Kanye West as Khan)"". Xlr8R. ^ Davies, Rodrigo (March 6, 2010). "Review: Doom, Enigmatic rapper lifts Sonar curtain". BBC 6Music. ^ "Adult Swim Presents 8 Singles 8 Weeks". Adultswim.com. Retrieved 28 September 2010. ^ "MF DOOM Says He's Done With The United States". potholesinmyblog.com. Retrieved 19 December 2017. ^ Pellyon, Jenn (November 1, 2011). "Hear Thom Yorke, Jonny Greenwood, and Doom: "Retarded Fren"". Pitchfork Media. ^ Fitzmaurice, Larry (December 16, 2011). "JJ DOOM: "Rhymin' Slang (Dave Sitek Remix)"". Pitchfork Media. Archived from the original on July 26, 2012. ^ Martin, Andrew (July 5, 2012). "JJ DOOM Reveal "Key To The Kuffs" Release Date, Tracklist". Complex. ^ http://hiphopdx.com, HipHopDX -. "Ghostface Killah Offers An Update On His Project With MF DOOM, Tells Fans To "Prepare" Themselves". Retrieved 19 December 2017. ^ Breihan, Tom (16 August 2013). "Captain Murphy – "Between Villains" (Feat. Viktor Vaughn, Earl Sweatshirt, & Thundercat) – Stereogum". Stereogum. Retrieved 24 November 2014. ^ Bishop Nehru & DOOM – Lex Projects Archived 2014-02-26 at the Wayback Machine. Lexprojects.com (2013-08-08). Retrieved on 2014-05-12. ^ "Bishop Nehru and DOOM are now releasing an album, NehruvianDOOM – FACT Magazine: Music News, New Music". 4 April 2014. Retrieved 19 December 2017. ^ Helman, Peter (20 November 2014). "Flying Lotus – "Masquatch" (Feat. Doom) – Stereogum". Stereogum. Retrieved 24 November 2014. ^ "Hip Hop Heads". Reddit. December 6, 2014. Retrieved December 6, 2014. ^ "Ghostface Killah Says Joint Project With Doom Could Be Dropping In February". HotNewHipHop. Retrieved 30 December 2015. ^ Evershed, Nick; Harmon, Steph; Harmon, Steph (2016-06-02). "The Avalanches' Frankie Sinatra: first new music in 16 years airs on Triple J". The Guardian. ISSN 0261-3077. Retrieved 2017-10-06. ^ "ADULT SWIM PRESENTS DOOM'S "THE MISSING NOTEBOOK RHYMES"". GasDrawls.com | MF DOOM. Retrieved 2017-08-08. ^ "MF DOOM to Drop 15 New Songs With Adult Swim – XXL". XXL Mag. Retrieved 2017-08-08. ^ "DOOM AND ADULT SWIM END THEIR RELATIONSHIP". MassAppeal.com. ^ "MF Doom & Czarface – "Nautical Depth"". SPIN.com. Retrieved 8 February 2018. ^ "DOOM XMAS (MF Doom remixes)". cookinsoul.bandcamp.com. Retrieved 24 December 2018. ^ "Update, Redux: Chicago gets a fake MF DOOM show too". 16 February 2010. Retrieved 19 December 2017. ^ Ortiz, Edwin. (2008-10-21) MF DOOM Addresses Rumors Of Fake Performances. HipHop DX. Retrieved on 2012-11-10. ^ http://hiphopdx.com, HipHopDX -. "Promoter Says DOOM Impostors Are "Intentional"". Retrieved 19 December 2017. ^ "The Mask of Metal Face Doom". The New Yorker. Retrieved 2017-03-03. ^ "Instagram post by DOOM. ALL CAPS. • Dec 18, 2017 at 8:10pm UTC". Instagram. Retrieved 18 December 2017. Wikimedia Commons has media related to MF Doom.